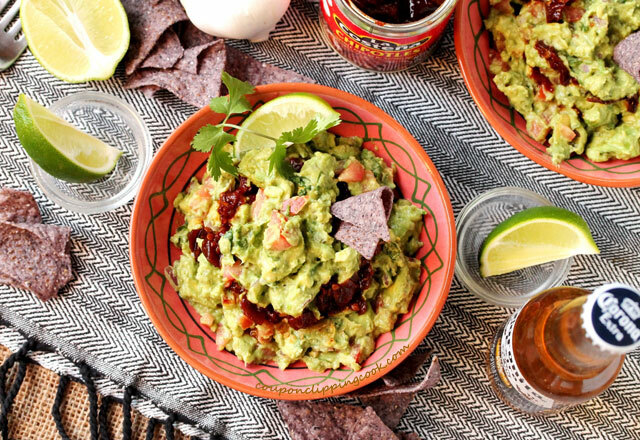 As if guacamole isn’t already delicious on its own, try adding some chipotles with adobo sauce to the mix. 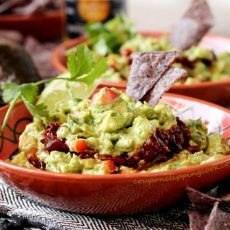 Chipotle peppers in adobo sauce are added to this guacamole in layers instead of just mixing them in so that the guacamole keeps its beautiful bright green color. 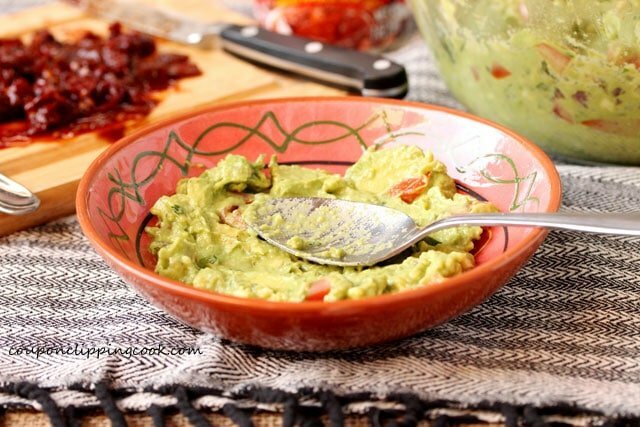 This guacamole is not only wonderful as a dip with chips but also tastes wonderful on top of scrambled eggs, as a spread in a sandwich, as a relish on top of meat, or just on it’s own as a side dish. 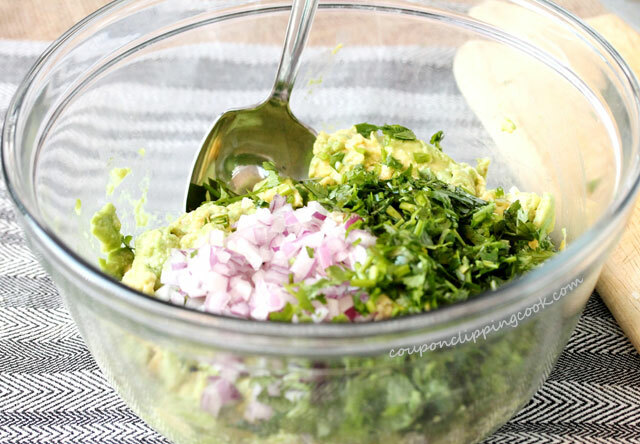 Making the guacamole just before serving is a good option so the vibrant green color is at its best. 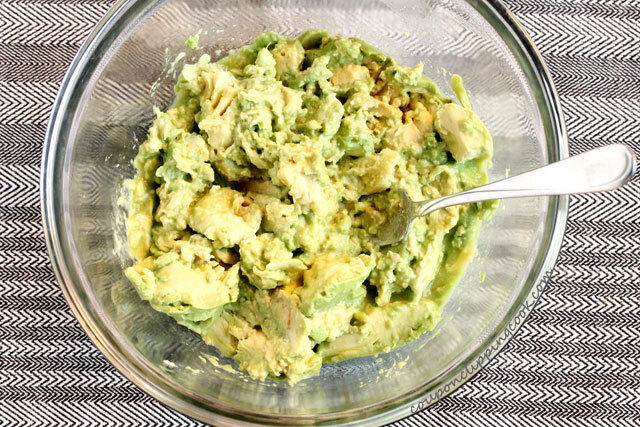 Even though lime juice is added I find that when guacamole is made ahead of time, the color turns a bit brown. 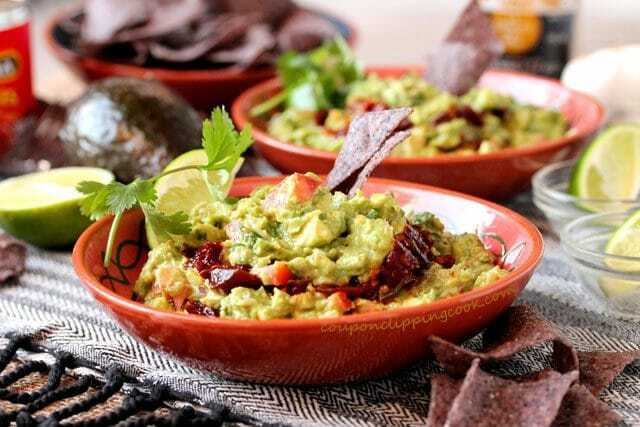 But, the onions, garlic, cilantro and tomatoes can be chopped ahead of time and stored together in the fridge which will save some time when it comes to assembling the guacamole. 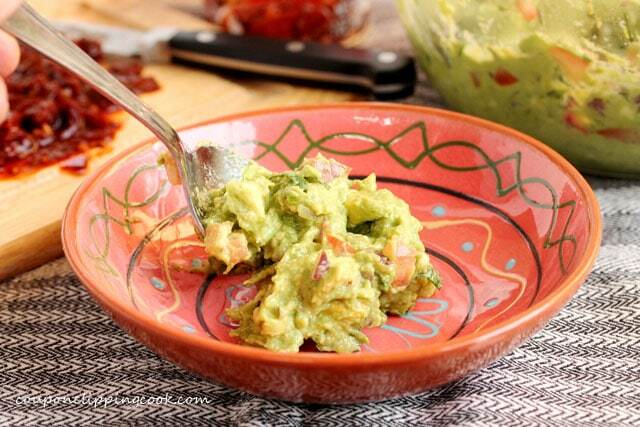 Since the chipotles add quite a bit of heat, this guacamole recipe doesn’t include jalapenos. But feel free to add them if you prefer more heat. 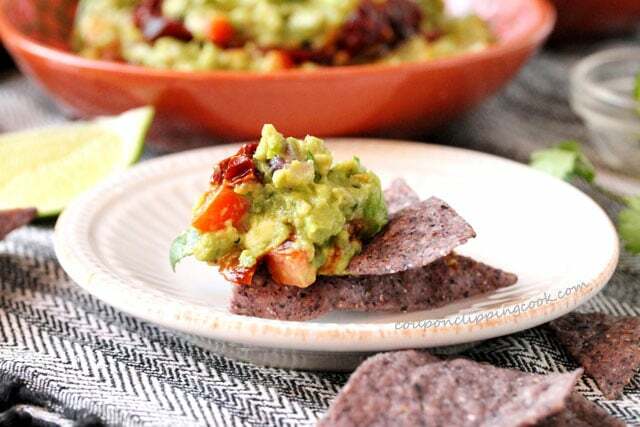 For the ingredients, it’s the usual culprits, ripe Haas avocados, fresh lime juice, red onion, garlic, cilantro, Roma (“plum”) tomatoes, salt and pepper. Plus 1 small can of chipotles in adobo sauce. 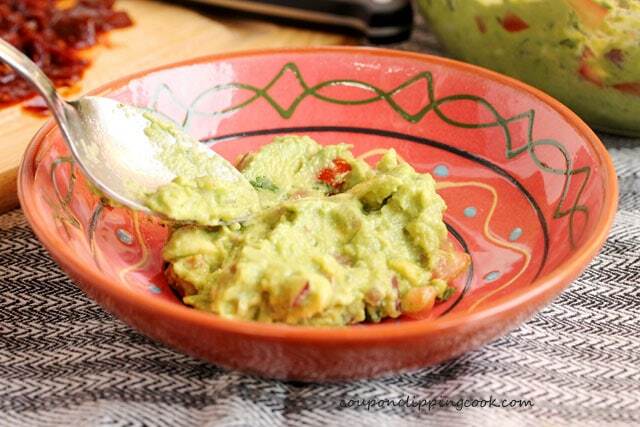 Since salt is key in guacamole, I like to use kosher salt because the grain size is bigger than regular salt. But if you don’t have kosher salt on hand, regular salt would work just fine. 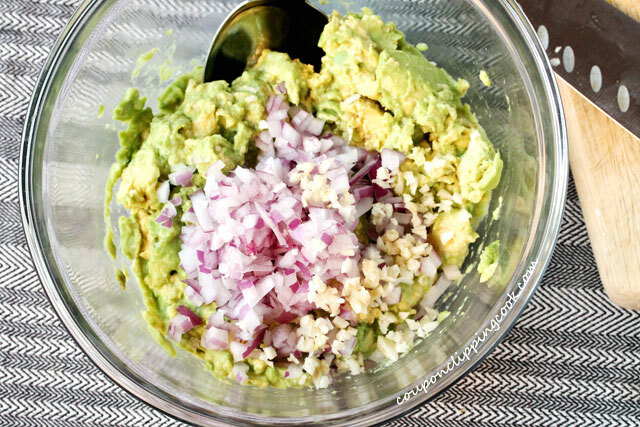 Just make sure to add enough because salt is key to a good guacamole. 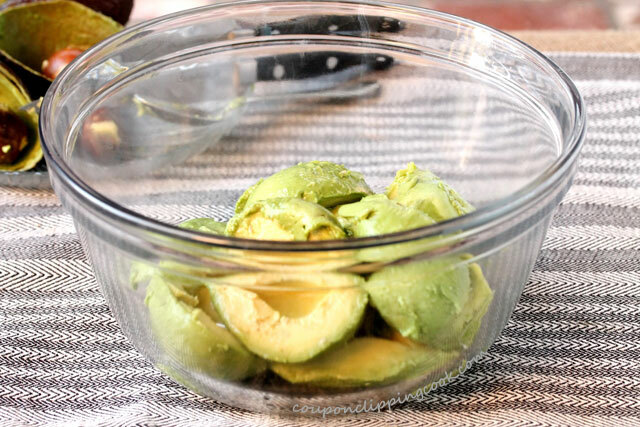 Ripe avocados are a must for delicious guacamole. 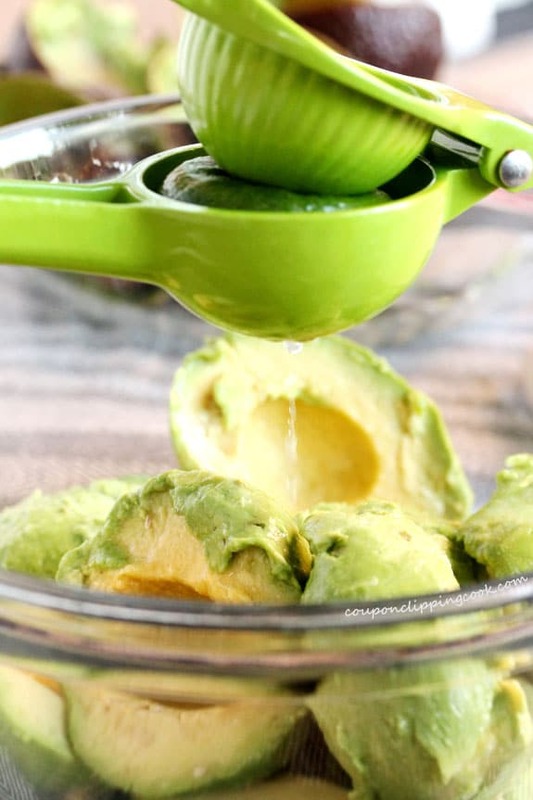 But if they’re too ripe, the flesh of the avocado will have dark spots and the texture will be more on the wet side and mushy. 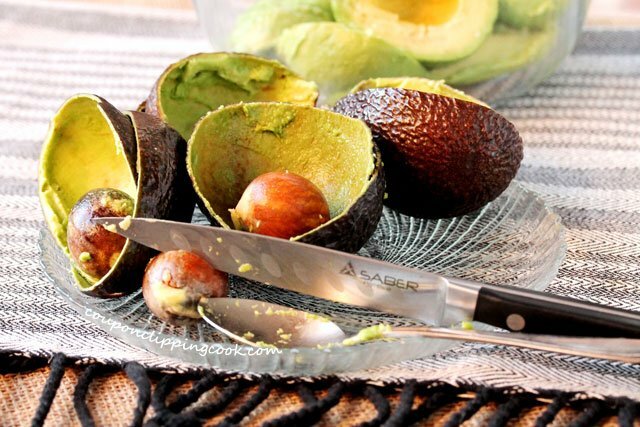 Slice the avocados in half lengthwise. 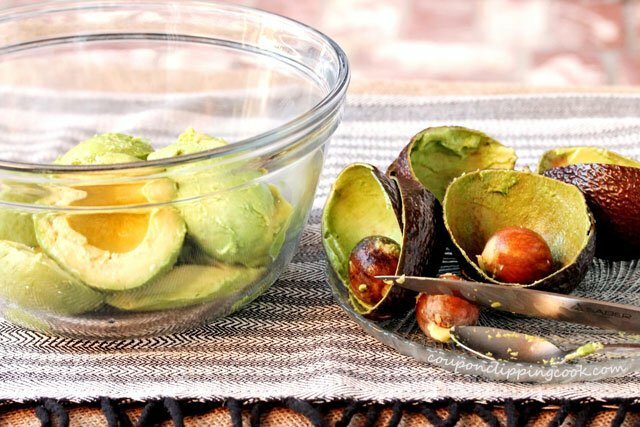 For each avocado, put the half with the seed in your hand and gently squeeze the skin from either top-to-bottom or side-to-side; then often times the seed will come loose. 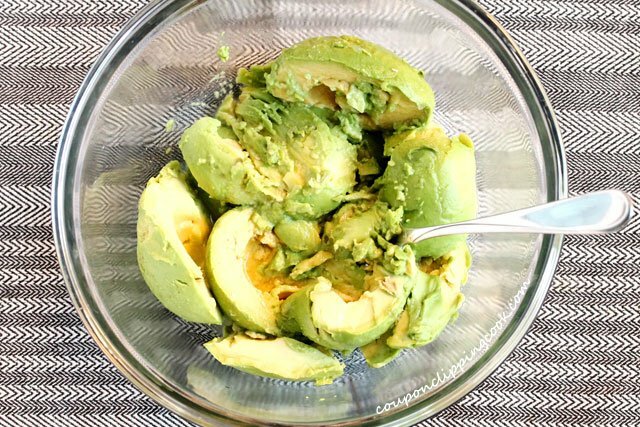 use a dinner-size spoon to scoop the flesh from the skin of each avocado and add it to a medium size bowl. 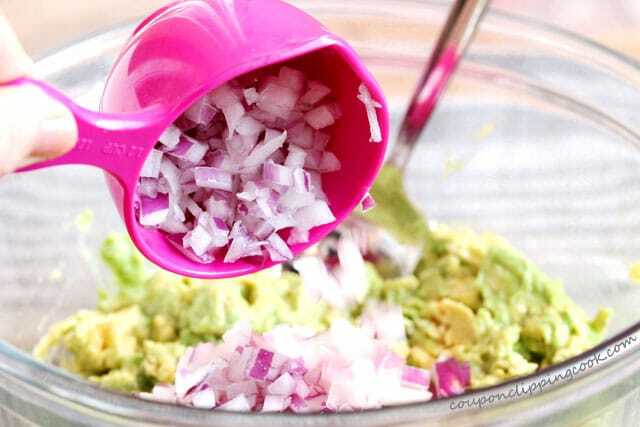 To the bowl, add the lime juice. 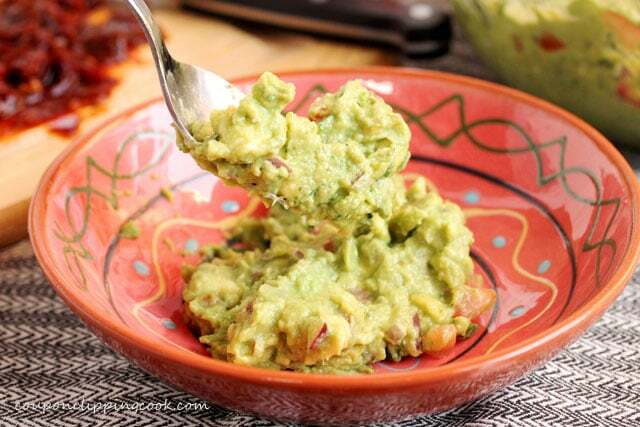 Although lemon juice can also be used, my personal fave is the taste of lime in the guacamole. …so there are still some chunks left. 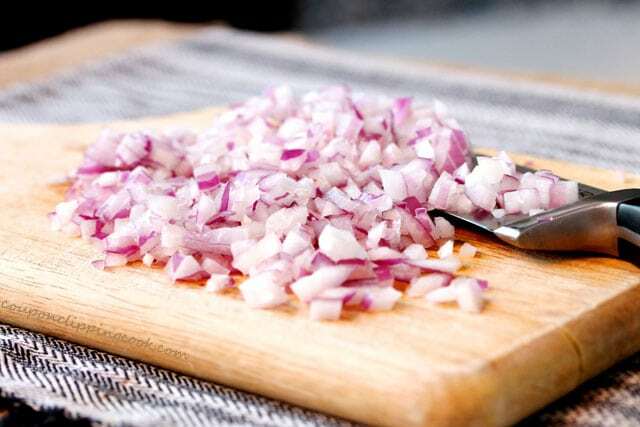 I personally like it when there is a little crunch from the onions so I chop them in small pieces but not too small. 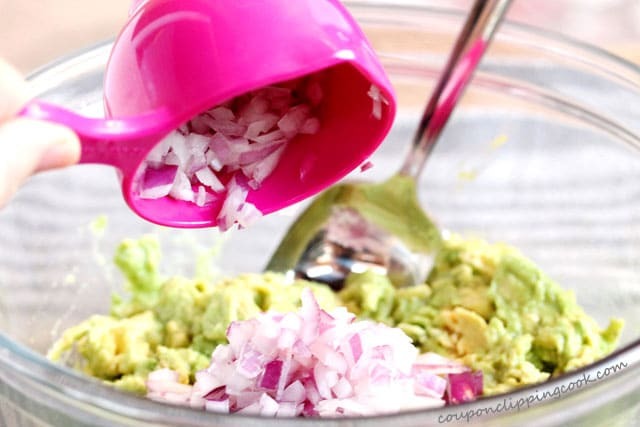 White or yellow onions can also be used but red onions add pretty color to the guac. 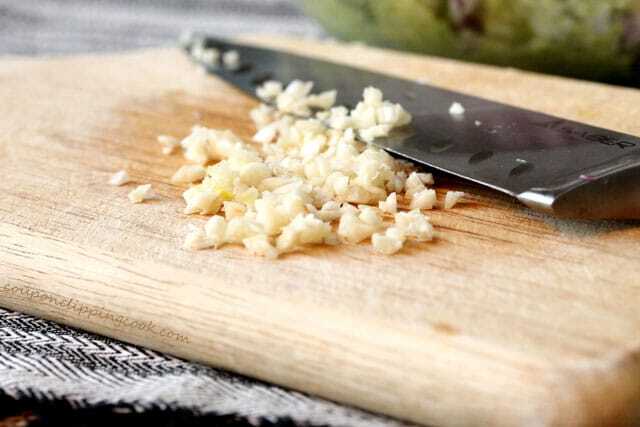 Finely chopped garlic is best so that there are no bites with a chunk of garlic in it. 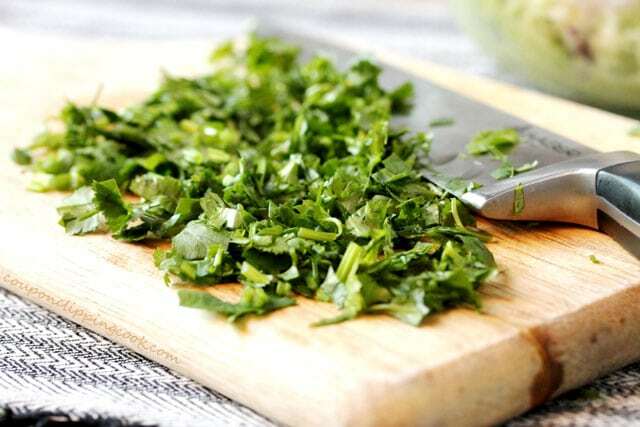 Including the tender stems when chopping the cilantro will add more yummy crunch to the mix. 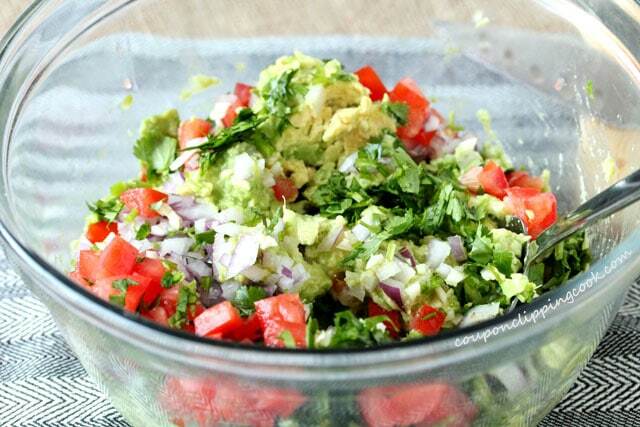 Add the cilantro to the bowl. Then last but not least, the tomatoes. 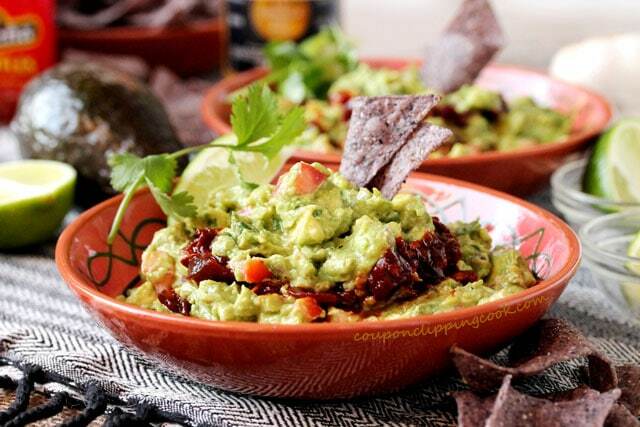 So that the guacamole isn’t too runny, remove and discard the pulp and seeds from the tomatoes before chopping them. 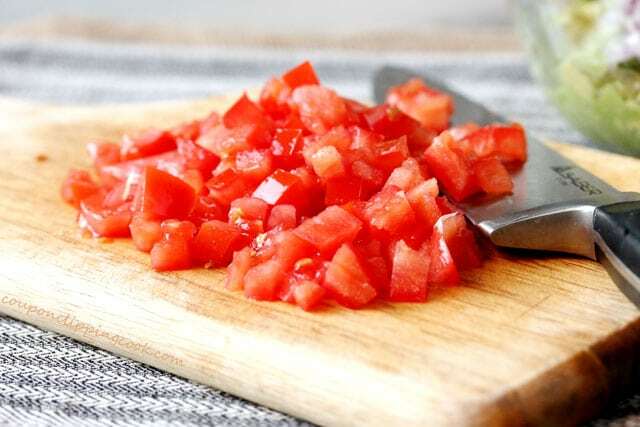 I like to use Roma (aka “plum”) tomatoes for guacamole because they stand up nicely when chopped. …gently stir. Then it’s taste test time. Give it a taste test and add more salt if needed. Salt really brings out the flavors so make sure to add enough. Chop the chipotles. Use utensils to handle the chipotle peppers and don’t handle them at all with your hands so to avoid burning your skin. And for sure don’t touch your eyes. 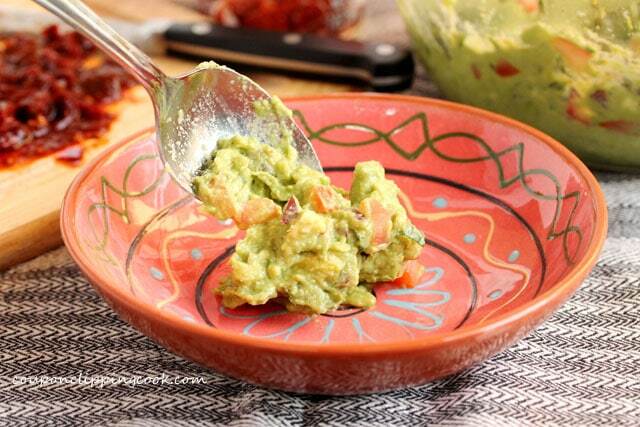 With the back of a spoon, smooth out the layer of guacamole. 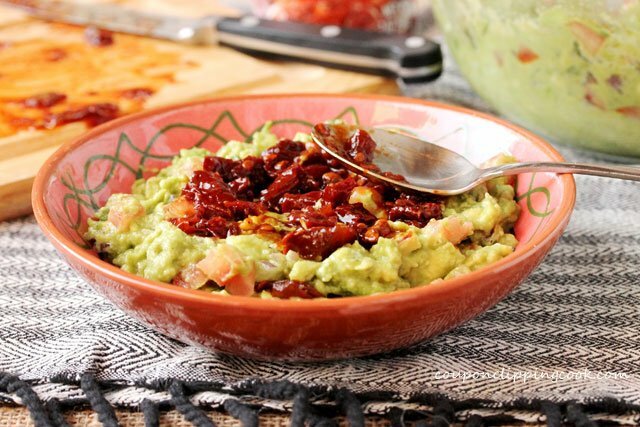 Then add a smooth layer of chipotles on top of the guacamole (these peppers are quite spicy and hot so make a thin layer if less heat is preferred). 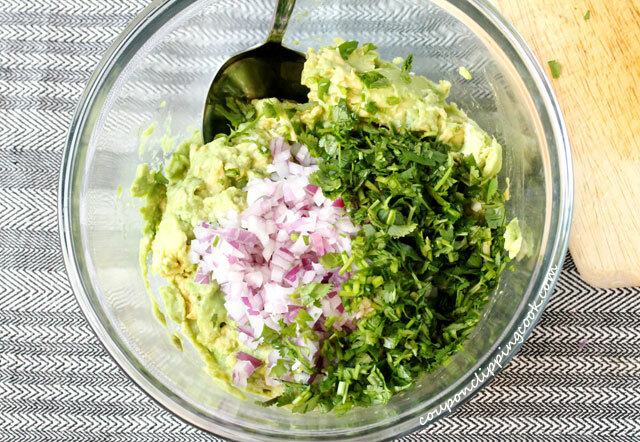 …and another layer of guacamole. Garnish with a lime quarter and sprig of cilantro. 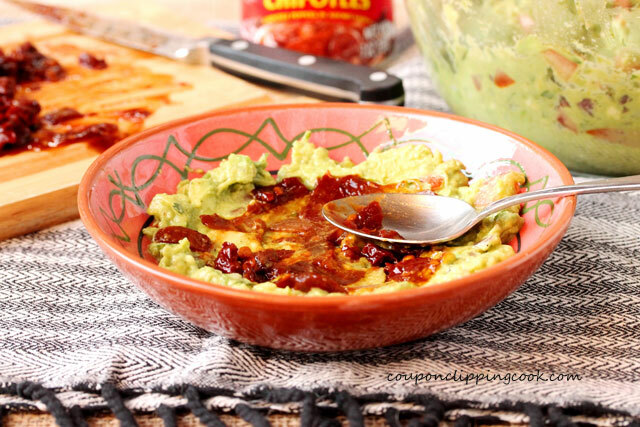 As if guacamole isn't already delicious on its own, try adding some chipotles with adobo sauce to the mix! Slice the avocado in half lengthwise. Put the half with the seed in your hand and gently squeeze the skin from either top-to-bottom or side-to-side; then often times the seed will come loose. Once the seed is removed, use a dinner-size spoon to scoop the flesh from the skin and add it to a medium size bowl. 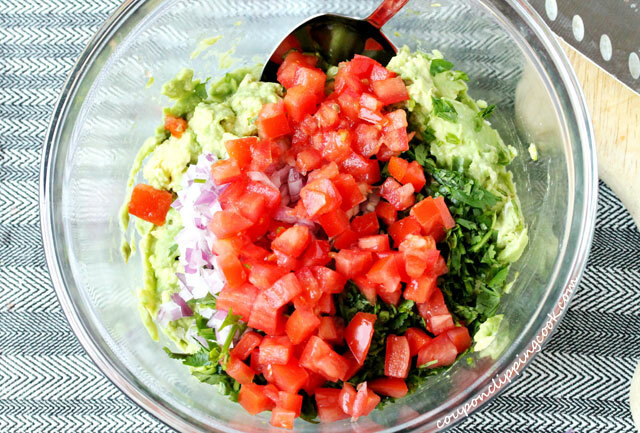 To the bowl, add lime juice. 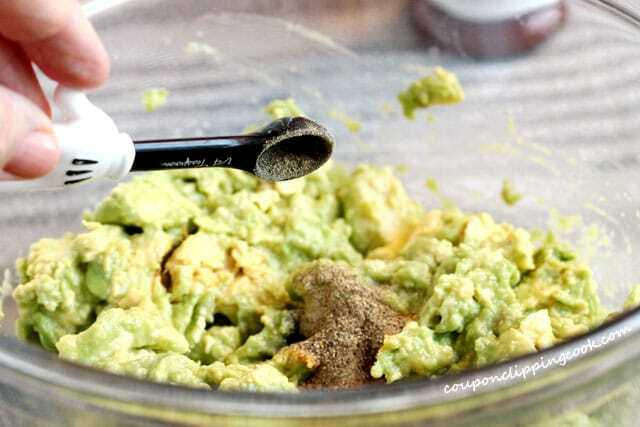 Mash the avocado gently leaving some chunks. Add the salt, pepper, red onion, garlic, cilantro and tomatoes. Gently mix together. Do a taste test and add more salt if needed (salt really makes the flavors all tie together so make sure to add enough). 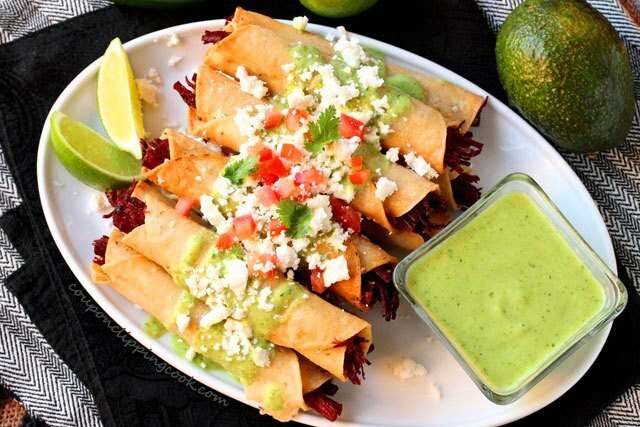 Garnish with lime wedges and sprigs of cilantro. Serve right away. Chop the chipotles. 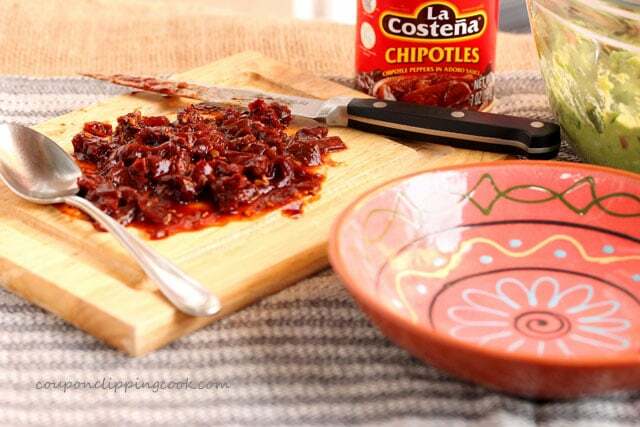 Use utensils to handle the chipotle peppers and don't handle them at all with your hands so to avoid burning your skin. And for sure don't touch your eyes. 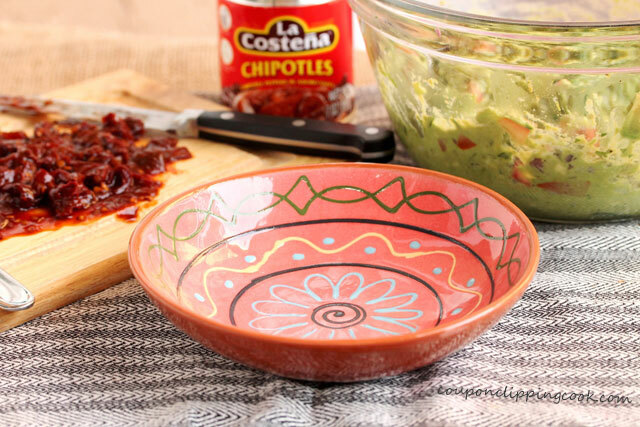 In a shallow serving bowl, add a layer of guacamole. 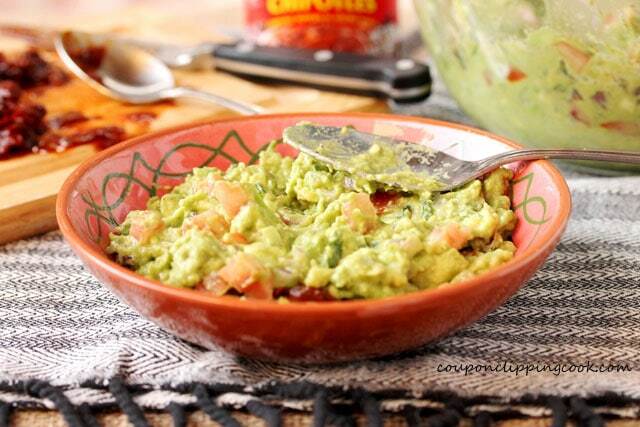 With the back of a spoon, smooth out the layer of guacamole. 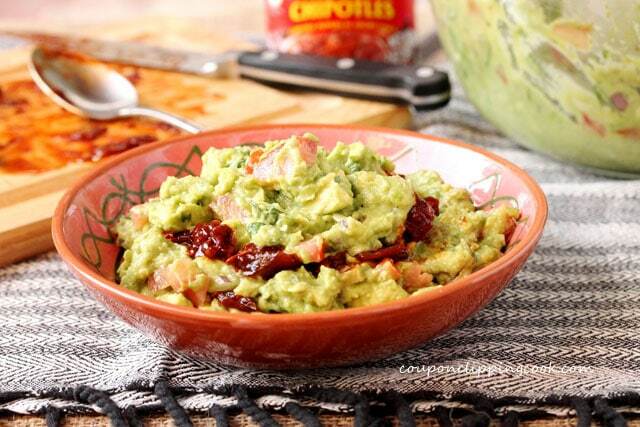 Top with another layer of guacamole, another layer of chipotles, and another layer of guacamole. 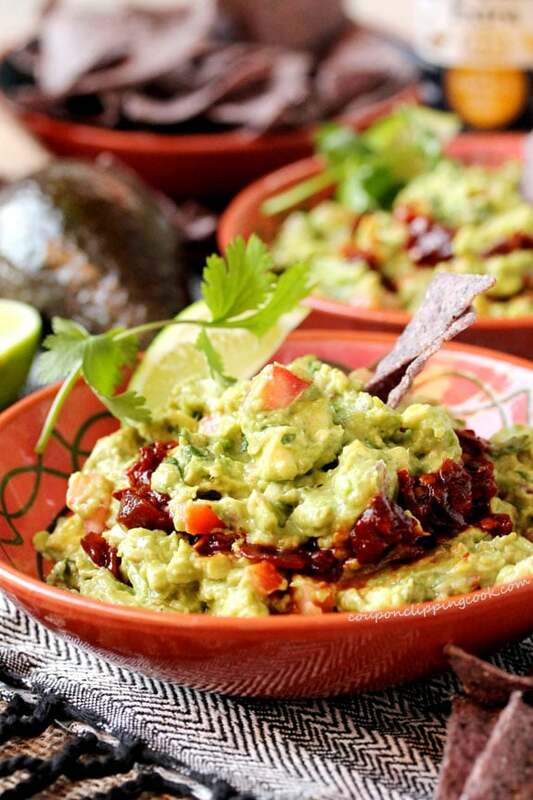 Garnish with a lime quarter and sprig of cilantro and serve. Holy moly. 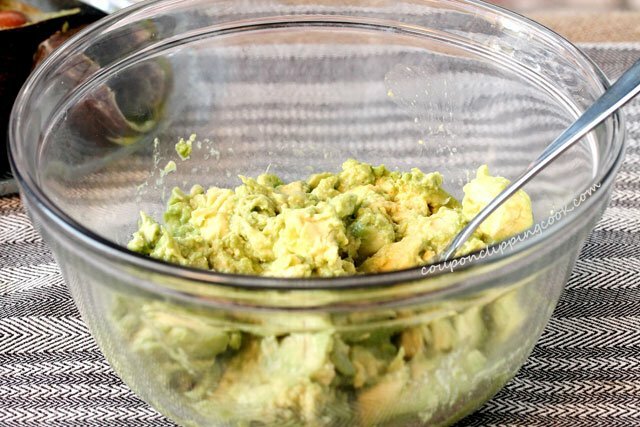 This might just be my new favorite guac recipe! Looks so flavorful! !